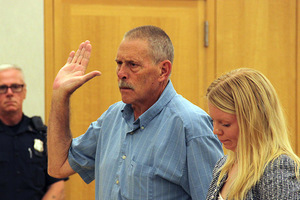 Westchester County District Attorney Anthony A. Scarpino, Jr. announced that Gerald Munson, a former Croton-On-Hudson Fire Department Chief and a former Croton-On-Hudson Police Officer who most recently served as the fire department treasurer, has pleaded guilty to Grand Larceny in the Second Degree as a Crime of Public Corruption, a class B felony. The charge is related to the theft of more than $300,000 from the Croton-On-Hudson Fire Department. Munson appeared in Westchester County Court Wednesday before Judge Michael Martinelli. At the time of his plea, he also paid $124,383 in restitution, added to the $25,000 he paid upon arraignment. Munson is scheduled for sentencing Oct. 29, 2018 at which time he is expected to pay the remainder of restitution and be sentenced to 1-1/2 to 4-1/2 years. As fire department treasurer, Munson was responsible for maintaining the Croton-On-Hudson Fire Department bank account and financial records despite having no prior qualifications or background in accounting or financial matters. The felony complaint alleges that he used his position as treasurer to steal and conceal his theft of approximately $312,925 from the Fire Department. The money he stole included portions of the so-called “2 Percent Money” paid annually to the Fire Department by New York State in connection with the State’s two percent tax on fire insurance. For years, Munson was able to conceal his ongoing theft by altering and manipulating the Department’s bank records. Those alterations and manipulations included his underreporting of the amount of “2 Percent Money” received by the Department in order to balance the books and hide what he stole for himself. In February 2018, members of the Fire Department’s internal Audit Committee discovered that Munson had provided them with false 2017 bank statements. When confronted by the Audit Committee, Munson admitted he had created the false statements on his home computer; that he had stolen money from the Department’s account for his own personal use; and that he had used the Fire Department’s debit card as if it were his own. Further investigation and analysis conducted jointly by the Village of Croton-on Hudson Police Department, the Westchester County District Attorney’s Office and the New York State Comptroller’s Office confirmed that between January 2011 and February 2018, the defendant stole approximately $312,925 from the Fire Department. This joint investigation lead to Munson’s arrest and felony charge. Village of Croton-on-Hudson Police Department arrested Munson in June 2018. Village of Croton-on-Hudson Police Chief Russel H. Harper added, "I want to thank Westchester District Attorney Anthony Scarpino and the Investigations Division Public Integrity Bureau, New York State Comptroller Thomas P. DiNapoli and the Croton Volunteer Fire Department Audit Committee for assisting the Croton Police Department in conducting this investigation. It was through this collaborative effort that justice will be served." Assistant District Attorney Brian Fitzgerald, Deputy Bureau Chief of the Westchester District Attorney’s Office Investigations Division Public Integrity Bureau, is prosecuting the case.